Thirty high school sophomores were recently selected to participate in the Missouri Department of Agriculture’s Missouri Agribusiness Academy. 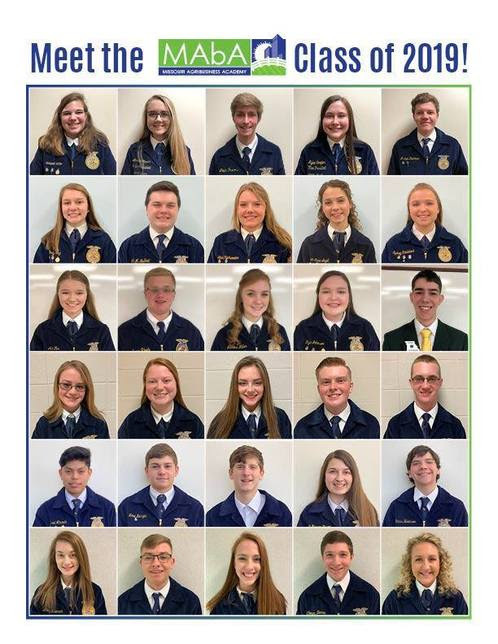 Students selected will spend the first week of June in the Springfield region exploring various segments of Missouri agriculture. Since 1988, the Missouri Agribusiness Academy has awarded more than 930 students through a competitive application and interview process. The 2019 MAbA marks the program’s 32nd year of promoting careers in agriculture to high school sophomores. To be eligible for the Missouri Agribusiness Academy, students must come from a farming family or be an active member of the National FFA Organization or 4-H.
Schyler Angell of Centralia, Mo. Cooper Beaver of Neosho, Mo. Lane Bollinger of Jackson, Mo. McKenzie Bowen of Bloomfield, Mo. Michael Dieckmann of Sibley, Mo. Lane Falch of Farmington, Mo. Ada Fox of Galt, Mo. Christin Gayer of Mansfield, Mo. Kylee Gengler of Syracuse, Mo. Seth Hansen of Chillicothe, Mo. Carson Hoth of Anderson, Mo. Emily Hoyt of Martinsburg, Mo. Rylee Johnson of Laredo, Mo. Caitlyn Kleffner of Rolla, Mo. Kraysen Leonard of El Dorado Springs, Mo. Abigail Miller of Olean, Mo. Jessica Miller of Barnard, Mo. Daniel Miranda of East Prairie, Mo. Grant Norfleet of Mexico, Mo. Thomas Owings of Potosi, Mo. Cooper Parsons of Warrensburg, Mo. Lexi Plackemeier of Silex, Mo. Isaac Rhode of Stewartsville, Mo. Madi Ridder of Marthasville, Mo. Trey Riley of St. James, Mo. Tanner Robinson of Poplar Bluff, Mo. Avery Schiereck of El Dorado Springs, Mo. Dawn Sherman of Warrenton, Mo. Amanda Stover of Tipton, Mo. Sydney Stundebeck of Salisbury, Mo. The MAbA class will convene at the Missouri Department of Agriculture on June 3. After a Department overview and tour, the students will travel to Springfield for the week. During the 2019 Missouri Agribusiness Academy, the students will visit agriculture businesses and learn about career opportunities in agribusiness, animal health, farming, ranching and more. For additional details about the 2019 Missouri Agribusiness Academy, as well as more information on the Department of Agriculture, please visit the department online at Agriculture.Mo.Gov.